Download Talkatone App : Talkatone Facebook | Android | Google Voice | Free Pc to Phone Calls, Free Voip Calls to India International ! If you having an iPhone or Android mobile and using internet on your phone, then Talkatone is a must have application for your smartphone. 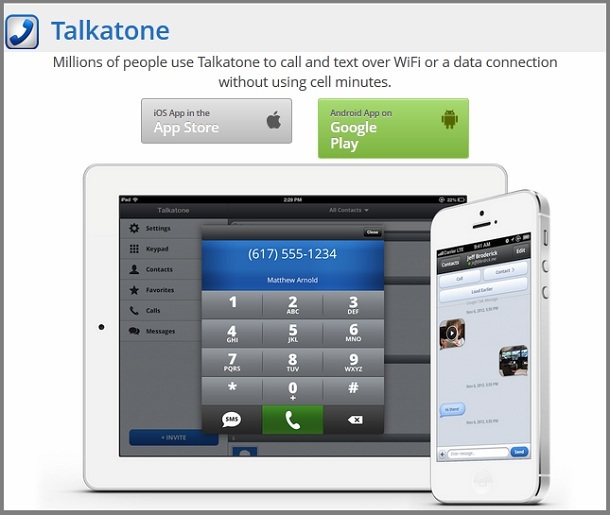 Talkatone was earlier available only for iOS devices (specifically iPhone), but you can now use Talkatone on your Android mobile and convert it to a true free phone. You must be aware about Google Voice service (you may already be using Google Voice), well Talkatone uses Google Talk and Google Voice services and bridges the gap between instant messaging on your computer and regular cellular calls on your mobile device. In simple words, if you use Google Voice on your mobile phone, you end up using your daily calls limit. But if you use Talkatone then you are not using Google Voice minutes but still making free international calls. You are not spending anything on your mobile minutes, no roaming charges, no change of number (keep your old number) wherever you are and communicate with your friends for free. You can login with your Facebook or Google (Gmail) account. After login you can call and chat with friends anywhere in the world, even when you are on a flight. Configure your Google Voice with Talkatone to have absolutely FREE calls and SMS to regular phone numbers in North America. After you activate Google Voice and set it up, talkatone will work all across the globe. All you require is internet connection. Please note that if you are traveling, then international data roaming charges may apply. So better get a local sim card with data plan and use Google Voice via Talkatone. Free calls/texts over WiFi or 3G/4G. Calls and texts with Facebook friends without phone numbers worldwide. Unbeatable FREE support within 24 hours. You must be wondering how does Talkatone make money if every call is free. Well, talkatone displays banner ads. For calls initiated through main dialer and completed by Talkatone, pre-roll ad may be shown once in a while. Facebook Chat on Talkatone is powered by Facebook ! Download the talkatone application on your mobile phones by clicking the below buttons. Once you have downloaded the app, follow onscreen instructions to setup your Google voice and Facebook accounts.Talkatone Android has received many good reviews in the Google Play (Android Market). Talkatone is very much liked app on iPhone and Android, however it does not have any official PC application (you need to use Android apk on emulator to use it on PC). Still Talkatone app on Blackberry is not available (and no response from talkatone guys), but we have created a post where you can atleast make a request. If you are still wondering about what's Talkatone, should I try Talkatone on my Android mobile ? Is it a safe application, won't it misuse my google/facebook password (it does not even store it). Will I be able to make free calls using Talkatone...? Just shoot them up in the comment section, for more info on Talkatone for Android Mobiles.